In this tutorial it is described how to monitor the complete status of hard disks, SSDs or other storage devices connected over the network with Hard Disk Sentinel - like if they would be directly connected to the computer. Generally Network Attached Storage (NAS) devices provide no self-monitoring status about them. From the viewpoint of the user (and software) we can read, write files and folders - but it is not possible to identify the hard disks, detect their temperature, health and complete self-monitoring S.M.A.R.T. data, error counters and statistical information. NAS devices sometimes provide internal S.M.A.R.T. checking - but it is not too detailed: it does not provide correct, real time temperature, monitoring about changes / degradations and there may be no alert on different issues. Hard Disk Sentinel can do all of the above - but only for disk drives connected directly to the computer. Until now. To access and detect the status information, it is required to "extend" the functionality of the Network Attached Storage (NAS) devices: to periodically detect and store the current status. These status information reports (status sources in the following) read, interpreted by Hard Disk Sentinel Professional so it displays the appropriate hard disks, SSDs, industrial memory cards and other storage devices like if they'd be connected directly to the actual computer. Below we discuss about how to extend the functionality of the Network Attached Storage devices (NAS boxes, routers and so) and how to configure Hard Disk Sentinel to read the created status source files. 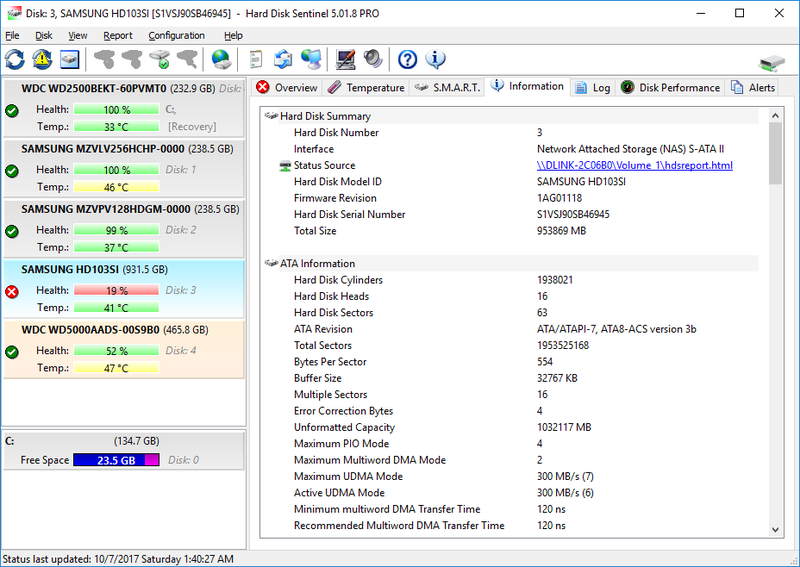 In order to make things work, we need Hard Disk Sentinel Professional 5.01.8 or newer running on a Windows computer which reads the Status Sources and displays the hard disk status, collect statistics, issue alerts and so. Also we need a Network Attached Storage (NAS) which can produce the Status Source file. The NAS need to have SSH access with root rights for the customization and the user should be familiar about basic Linux commands (knowledge of chmod, cron is at least recommended). The most important is that the Network Attached Storage device should provide SSH access in order to extend its functionality. 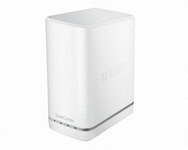 Some devices may support it out-of-the-box or support it via official plug-in (like the D-LINK DNS327L . Some others may require tweaks, add-ons (like the fun-plug used with D-LINK DNS320LW if used with older firmware) or even special firmware. Please note that unofficial modifications, firmware updates may void warranty so please be careful! Personally I do not recommend such actions, if you're not sure, ask the manufacturer about the situation as they can assist about SSH access (or hopefully for increased number of requests, they may add the required functions in a future official release to make things easier). Please note that due to high number of different devices, firmware, it would be impossible to provide step-by-step guide for all devices, but I try to show the idea generally and illustrate with some devices, hopefully this helps in making changes on the actual device. Start PUTTY and log in to the NAS device as root. The folder /shared/ shared on the network, so we should create status source in that folder. Advanced users may even create a new, different share just for this purpose by editing the samba configuration file. Then press CTRL+X to exit and save the updated list. By this new entry in crontab, the Linux HDsentinel (which downloaded in the /hdsentinel folder) launched every 10 minutes and it saves report to /shared/hdsreport.html file which is accessible over the network. After some time (10 minutes or fewer, depending the actual clock) hdsreport.html file created and saved. This hdsreport.html file contains the complete status of all found hard disk drives, SSDs, flash drives, industrial memory cards and so. The file can be opened in any web browser to quickly check the status of the devices, even outside (without installation of) Hard Disk Sentinel Professional, which is an instant advantage and by this, the NAS functionality is improved. If the NAS device supports external USB port(s) for additional storage, external hard disk(s) connected there also automatically enumerated, detected and reported. 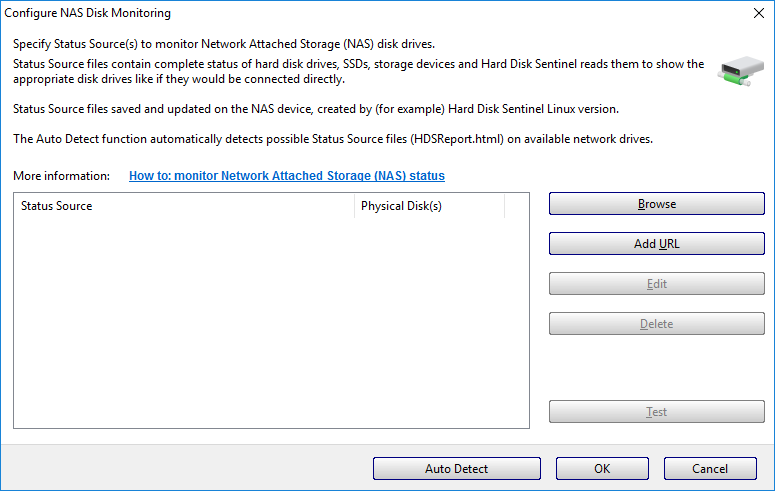 When the status source(s) configured to be created and automatically updated by the NAS, it is required to configure Hard Disk Sentinel Professional running on the Windows computer to use it: read, process and display the contents. For this, please select File menu -> Configure NAS Disk Monitoring. performing automatic detection which scans the root folder of all network mapped drives and automatically add found hdsreport.html files. So if the shared folder of NAS drive is mapped as network shared drive, then it is only required to click the Auto Detect button. 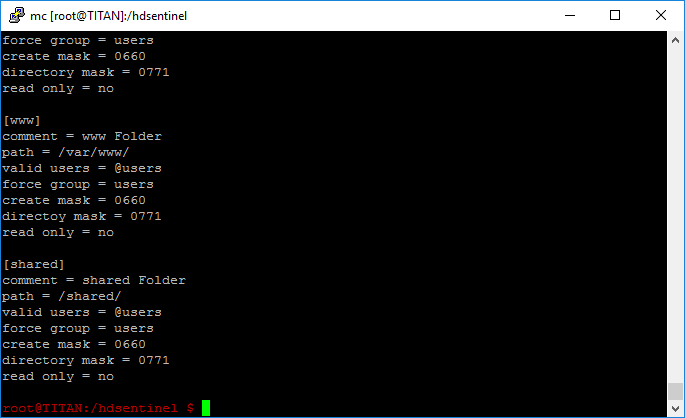 Hard Disk Sentinel Professional automatically attempts to connect and read the file and shows the amount of hard disk(s) found in the configured Status Source. After clicking OK in this window, the Status Source(s) processed and the hard disk drive(s) displayed just like disk drives connected directly to the actual computer (internally or by USB / eSATA). Hard Disk Sentinel Professional shows Network Attached Storage disk drives with different (light orange) background to indicate that these devices are not direct connected disk drives - but attached to the network. The connection state symbol in the upper right corner shows the actual status: green if all configured Status Sources could be read and processed - red if one (or more) Status Sources unreadable (network error). Then, in all following perioidc detection cycles, Hard Disk Sentinel will attempt to read and update the disk status, issue alerts if required. If you prefer to cancel or adjust monitoring, it is possible in the File menu -> Configure NAS Disk Monitoring window, where it is possible to edit the Status Source location (for example if the device changed name, IP address or so) or delete the Status Source from the list. If you prefer to disable creation of Status Source files on the NAS itself, you can log in by SSH and remove the entry from cron jobs, delete the saved software and its associated folder too. Note: Un-registered (trial) Hard Disk Sentinel Professional version allows configuring Status Source(s) for evaluation purposes but on restart, the setting automatically discarded (need to be configured again). Also the trial version shows partial information on the S.M.A.R.T. page only. The registered (complete) version keeps the configured setting and displays the complete status automatically after restarts. Hard Disk Sentinel standard version does not support NAS monitoring, only Hard Disk Sentinel Professional has this option. To monitor network attached storage where Hard Disk Sentinel is not available (for example on FreeBSD / FreeNAS systems) it is possible to use smartctl tool to export disk status information and use it as status source for Hard Disk Sentinel Professional. This creates smartsda.txt file in the /shared folder (assuming that it is shared - but you may use cat /etc/samba/smb.conf to find out the folder which is available over the network about /dev/sda device. The important is to keep the -r ataioctl,2 section as this enables logging of "raw" disk information (identification and self-monitoring data) which is not processed/translated/interpreted in any ways. You may need to modify the device name (/dev/sda), the device detection method (-d sat) too. Plus you'll need to create different schedule for each of the device(s) you prefer to monitor and add all such status sources one-by-one into Hard Disk Sentinel Professional. Depending on the actual system, smartctl may be located in different folder, for example /usr/local/modules/bin/smartctl or something else. Using find / -name "smartctl" command may help to find the tool. Call to arms: NAS users who can create and share (to help other users) a short step-by-step tutorial to illustrate functionality with their device(s), we can offer lifetime license (with lifetime free updates) of Hard Disk Sentinel Professional Family license. Please contact at info (at) hdsentinel (dot) com for details.